I produce programmes on the natural world and environmental issues for BBC Radio. I was lead producer on BBC Radio 4's Natural Histories (series 1, June - December 2015), Shared Planet and Saving Species as well as producing many other documentaries and one-off programmes. Most of my radio programmes can be found on Soundcloud. A selection is listed below. To be broadcast on 16 September 2018, this 45 minute documentary asks the question - as we lose the abundance of the natural world, are we also losing our ability to express ourselves? Nature has always been a primary source of our creative expression for art, music, poetry, prose and science. But, over the last 50 years we have lost half the mass of wildlife on earth so where will our inspiration spring from? Can we replace nature with the human world? Featuring interviews with a wide range of experts from the arts, psychology, archaeology and even computer games, I explore exactly how nature has inspired us and wonder if it will continue to do so. In November 2015 I, along with Dave Battcock, produced a live event at the Natural History Museum in London. The Big Story was the finale to Series One of Natural Histories. It was presented by Brett Westwood with Tamsin Greig performing the readings. 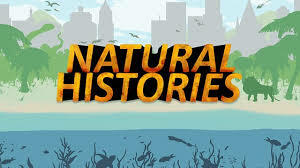 Natural Histories is a landmark series looking at the relationship between culture and the natural world. Would You Eat An Alien? was a four part BBC Radio 4 series which aired in 2015, on the ethics of eating animals, with Prof Christine Nicol. Jake Yapp is the hapless spaceman who crash lands on a planet and has to decide what alien he will eat. Shared Planet ran to two series (2014- 2015) and looked at the connection between human population and nature. It was presented by Monty Don. Saving Species was a live magazine series that ran for 2 year, reporting on conservation projects around the world. It was presented by Brett Westwood. Monastic Gardens was 5 x 15 minute series that explored the gardens of different monastic orders. A listener wrote to me saying "it was the most beautiful and thought-provoking programme I have ever heard." “The standard of entries this year was very high. Gardens of Faith were tremendous programmes - stimulating and thoughtful, elegantly presented, technically accomplished, and utterly compelling listening. The top prize went to Gardens of Faith because we felt that its subject matter was ambitious - addressing issues both topical and important. Gardens of Faith is just what radio ought to be: demanding, challenging, thought-provoking, instructive. It richly rewarded our attention. Nature - is a long running series of documentaries on Radio 4 exploring issues that effect wildlife. Click on the link to hear some of my programmes. A Life With... was 5 x 15 minute programmes meeting people who are obsessed with particular species. I produced and presented these programmes. Solitude - parts 1 & 2 was a two part series looking at being alone. In part one those who choose to be alone explain their motives, in part two we hear from people who had solitude thrust upon them. Presented by Peter France. The section where I eat a banquet of hornets made Pick of the Year in 2000! Rituals was a single documentary presented by Dr Gillian Rice that looked at why all human societies have rituals - and asks - do animals? Amazonia - Keeping it Alive A one-off documentary on the future of the Amazon. I explore the idea of whether it is possible to keep it as a wilderness area - or indeed if it has actually been managed for thousands of years. I produced and presented this programme. Tony Juniper, a guest in the programme who studied parrots in the Amazon. World on the Move was a live series on Radio 4 that tracked animal migration around the world. Viper Lies Coiled is a short, allegorical tale on extremism - wherever it comes from. Extremists are tunnel-visioned and fail to see goodness in its many forms. Extremists only see God as themselves. Read by Peter France. A favourite walk that turns out very differently to normal. Who is the lady on the beach?